Breguet Tourbillon wiht Power Reserve and Thermometer "Very Rare"
Breguet represents tradition and innovative technology. They revolutionized the art of watchmaking with inventions such as the tourbillon and pare-chute shock protection. Marie Antoinette and Napoleon were among Breguet's exclusive clientele. Abraham-Louis Breguet was one of the most prolific watchmaking geniuses of his time. He was born in 1747 in the Swiss town of Neuenburg and later founded his workshop in Paris in 1775. There he developed creations such as the first automatic pocket watch and the No. 160, also known as the Marie Antoinette. The Marie Antoinette is considered one of the most complicated watches in the world. The watch was commissioned in 1783 by an anonymous admirer of the queen and took 44 years to complete. Unfortunately, the French queen never got to marvel at her watch, as she was executed in 1793. 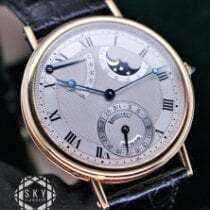 However, she was not the sole admirer of Breguet's work: Tsar Alexander I of Russia, Napoleon Bonaparte, and Sir Winston Churchill were all customers of the innovative manufacturer. The company remained family-owned until 1870, at which point it was passed to watchmaker Edward Brown. After several different owners and investors, Breguet joined the Swiss Swatch Group in 1999 and remain there to this day. Under the umbrella of the Biel-based Swatch Group, the brand began to flourish once again. Designers drafted intricate watches with double tourbillons as well as traditional, nostalgic watches harkening back to the beginnings of the company. One of the most well-known contemporary series is the Classique collection. These watches exemplify the traditional values of the brand. The Reine de Naples series is aimed at lovers of classic women's watches. This collection is modeled after a wristwatch Abraham-Louis Breguet designed in 1810 for Caroline Murat, Napoleon's sister. The watches in the Marine series interpret classic Breguet traits in a sporty, modern fashion. They may initially evoke images of robust diving watches, but closer examination reveals the use of precious materials. The watches are crafted using 18-karat white or rose gold, as well as platinum, with delicate movements and diverse complications resting inside each case. Abraham-Louis Bregret revolutionized the art of watchmaking with his ingenious innovations. His inventions such as the tourbillon are still used today to improve the precision of mechanical watches. The catalyst for this innovation was the fact that most men carried their pocket watches vertically in their vests during the 18th and 19th centuries. The effects of gravity led to considerable deviations from the exact time. In 1801, Breguet mounted the balance wheel and the escapement in a rotating cage that rotates once per minute. The rotation significantly compensates for the accelerating and decelerating movements. To this day, watches with tourbillons are the best performers on chronometer tests. The so-called Breguet balance spring has likewise worked to increase watch precision since its introduction in 1795. Unlike the traditional balance spring, this balance spring's last coil is raised and bent in towards the center. Therefore, the end of the spring protrudes out over the otherwise flat spiral. Because of this, the balance spring can "breathe" concentrically, improving precision. The Swiss manufacturer, based in L'Abbaye, still utilizes this innovation in their calibers. Equally as groundbreaking was the development of the "pare-chute," the precursor to modern shock protection. This invention came to be in response to the easily-breakable balance pivots and delicate ruby cylinders. Breguet constructed a steel strip spring with a free end to suspend the pieces elastically. In 1790, he presented the first prototypes of the pare-chute shock protection during an audience with the then French foreign minister, Charles-Maurice de Talleyrand-Périgord. The Parisian watchmaker purposefully dropped a pocket watch on the floor for his audience. To everyone's astonishment, it continued ticking when he picked it back up. The manufacturer's innovative spirit hasn't decreased since the turn of the millennium. To this day, the masters at Breguet are developing revolutionary innovations in the field of watchmaking. One example is the use of silicon. The designers use the metalloid in the calibers they produce in-house. The advantages of using silicon are quite clear. Not only is the material anti-magnetic, but it's also three times less dense than steel or brass. Thus, silicon parts reduce inertia while still being robust and resistant to abrasion and corrosion. These qualities are particularly interesting in parts such as the escape wheel, pallet, and balance spring. In 2006, Breguet introduced the Classique 5177, 5197, and 5837 models, the first-ever watches featuring silicon parts. The Type XXII 10 Hz watch includes three silicon components: a balance spring, escape wheel, and pallet. This is the first mechanical stopwatch from Breguet, ticking along at 72,000 vibrations per hour (A/h). Watches running at 28,800 A/h, so at a frequency of 4 Hz, are more common. 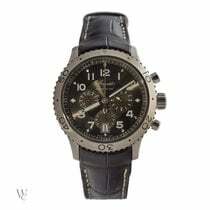 The designers successfully raised the frequency by 150%, thereby increasing precision and the chronograph function. The jumps made by the stopwatch seconds hand are so small that they appear as a single smooth movement to the human eye, and it's possible to stop exactly at 1/20th of a second. Silicon has opened the doors to many new possibilities. Watchmakers are now able to mount balance pivots magnetically for the first time. Due to the reduced friction and the stable rotation, precision has been increased. Moreover, parts of the caliber no longer require lubrication. Due to his enormous success and popularity, A.-L. Breguet had to deal with numerous imitators in his time. In 1795, he introduced a secret signature on his timepieces to address this issue. The signature is located on the dial and is nearly invisible unless light falls on it in just the right way. The signature is still a guarantee of authenticity today. For more than 200 years, the world-famous Breguet hands have been telling time. Their points are hollowed out in an eccentric manner, resembling crescent moons. These simple, yet elegant hands point to a series of delicate numbers, designed by A.-L. Breguet himself, resting around the dial. Known as Breguet numerals, the numbers are predominantly found on models with enamel dials. The watchmaking genius created another unmistakable mark for his watches. 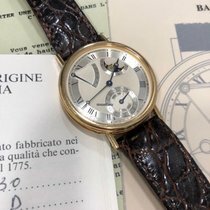 Prior to 1786, Breguet began using the gold or silver guilloché dials, which would become one of the most important trademarks of the brand. To create these signature dials, the watchmaker must smooth and form the dial, making it non-reflective - and this all by hand. Decorative patterns such as sunbeams, waves, or checkerboards give each watch a unique look. Every piece receives a unique production number, emphasizing their individuality. Each Breguet watch is a one-of-a-kind piece of art, just like the famous Marie Antoinette. The No. 160 was mysteriously stolen from a museum in Jerusalem in 1983. It resurfaced in 2007, but it was three years too late. Watchmakers and designers had already painstakingly reconstructed the watch using drawings and archived documents as their basis.